NJIT has made the President’s Higher Education Community Service Honor Roll for six years. 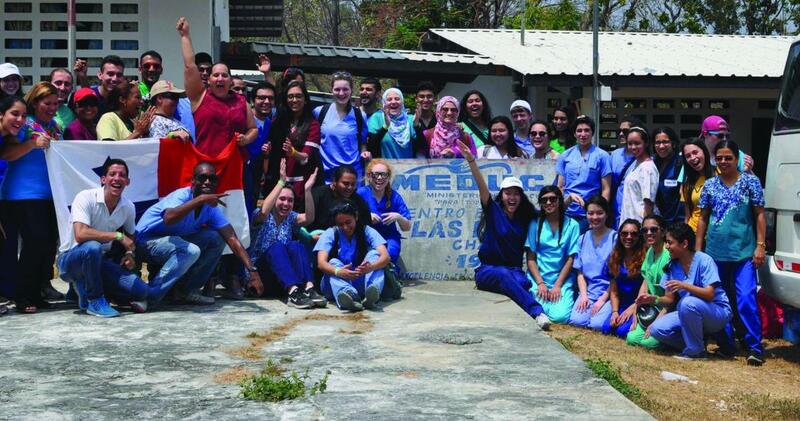 Members of NJIT's chapter of Global Brigades partnered with medical professionals on health care initiatives in Las Lajas, Panama, during spring break. In observance of National Volunteer Week, April 23-29, here we feature facts and figures about the community service contributions made by NJIT students, and also hear about the “win-win” impact of volunteerism from the students themselves. From Alternative Spring Break and Global Brigades, to after-school STEM mentoring and neighborhood beautification projects, to feeding the hungry and knitting hats and blankets for those in need, NJIT students are involved in a range of community service initiatives. While they are certainly helping others, they also are reaping personal rewards. NJIT’s Career Development Services (CDS) plays a vital role in volunteerism at the university and beyond. It serves as NJIT’s central location for community service, working with student groups and other departments and offices to connect students with a variety of projects and programs — and the appreciation for such involvement is heartfelt. “NJIT students have so much to offer Newark youth as role models who are going to college and pursuing a successful STEM career,” said Elizabeth Weisholtz, executive director, Newark Mentoring Movement. “NJIT prepares its graduates for positions of leadership as professionals and as citizens,” noted Greg Mass, CDS executive director, of the university’s culture of service.